This goes to all parents: NEVER LEAVE YOUR CHILD UNATTENDED WHEN RIDING AN ESCALATOR. 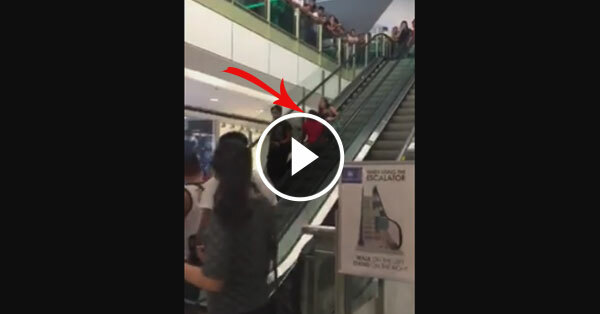 A video goes viral online as netizens were left in awe after watching it. A child got stuck in a moving escalator and was able to suffer injuries because of the incident. A certain Tayts Mariano posted on her Facebook account a short video clip containing an incident which happened in SM San Lazaro, last Wednesday. In the video, a woman was screaming and panicking as she was desperately asked for help as her child got stuck in a moving escalator. Luckily, a concerned citizen immediately pressed the emergency stop bottom of the escalator, causing fewer injuries to the child. As the woman, which looks like the child’s mother, screamed for help, the mall’s security personnel rush to the area and offered help. They pulled the poor boy out of the escalator and was rushed to the nearest hospital. After the incident, the child’s mother refused to file a complaint towards the SM management. It’s still not clear as to whom to blame, the negligence of the mother or the mall. As of the moment, the child was out from the hospital. This reminder goes to all parents/guardians not to take for granted the safety of your children when riding escalators. See to it that they do not have loose shoelaces, too long clothes that might stuck in the escalator and it is also better to place the children in between two adults for safety purposes.